"NAFTA" redirects here. For other uses, see Nafta (disambiguation). Bill Clinton's remarks on the signing of the North American Free Trade Agreement Implementation Act, December 8, 1993. U.S. congressional approval for NAFTA would have been impossible without addressing public concerns about NAFTA's environmental impact. The Clinton administration negotiated a side agreement on the environment with Canada and Mexico, the North American Agreement on Environmental Cooperation (NAAEC), which led to the creation of the Commission for Environmental Cooperation (CEC) in 1994. 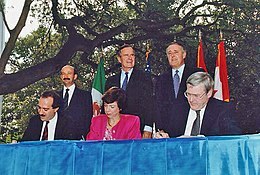 To alleviate concerns that NAFTA, the first regional trade agreement between a developing country and two developed countries, would have negative environmental impacts, the commission was mandated to conduct ongoing ex post environmental assessment, It created one of the first ex post frameworks for environmental assessment of trade liberalization, designed to produce a body of evidence with respect to the initial hypotheses about NAFTA and the environment, such as the concern that NAFTA would create a "race to the bottom" in environmental regulation among the three countries, or that NAFTA would pressure governments to increase their environmental protections. The CEC has held[when?] four symposia to evaluate the environmental impacts of NAFTA and commissioned 47 papers on the subject from leading independent experts. Maquiladoras (Mexican assembly plants that take in imported components and produce goods for export) have become the landmark of trade in Mexico. They moved to Mexico from the United States, hence the debate over the loss of American jobs. Income in the maquiladora sector has increased 15.5% since the implementation of NAFTA in 1994. Other sectors now benefit from the free trade agreement, and the share of exports to the U.S. from non-border states has increased in the last five years[when?] while the share of exports from border states has decreased. This has allowed rapid growth in non-border metropolitan areas such as Toluca, León and Puebla; all larger in population than Tijuana, Ciudad Juárez, and Reynosa. 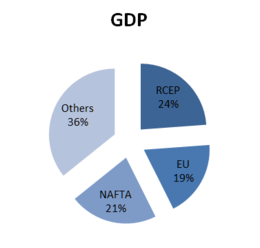 The U.S. foreign direct investment (FDI) in NAFTA countries (stock) was $327.5 billion in 2009 (latest data available)[when? ], up 8.8% from 2008. The US direct investment in NAFTA countries is in nonbank holding companies, and in the manufacturing, finance/insurance, and mining sectors. The foreign direct investment of Canada and Mexico in the United States (stock) was $237.2 billion in 2009 (the latest data available), up 16.5% from 2008. According to a study in the Journal of International Economics, NAFTA reduced pollution emitted by the US manufacturing sector: "On average, nearly two-thirds of the reductions in PM10[clarification needed] and SO2[clarification needed] emissions from the U.S. manufacturing sector between 1994 and 1998 can be attributed to trade liberalization following NAFTA." Several studies have rejected NAFTA responsibility for depressing the incomes of poor corn farmers. The trend existed more than a decade before NAFTA existed. Also, maize production increased after 1994, and there wasn't a measurable impact on the price of Mexican corn because of subsidized[who?] corn from the United States. The studies agreed that the abolition of U.S. agricultural subsidies would benefit Mexican farmers. A treaty[clarification needed] with China would extend similar rights to Chinese investors, including SOEs. In a 60 Minutes interview in September 2015, 2016 presidential candidate Donald Trump called NAFTA "the single worst trade deal ever approved in [the United States]", and said that if elected, he would "either renegotiate it, or we will break it". Juan Pablo Castañón [es], president of the trade group Consejo Coordinador Empresarial, expressed concern about renegotiation and the willingness to focus on the car industry. A range of trade experts have said that pulling out of NAFTA would have a range of unintended consequences for the United States, including reduced access to its biggest export markets, a reduction in economic growth, and higher prices for gasoline, cars, fruits, and vegetables. Members of the private initiative in Mexico noted that to eliminate NAFTA, many laws must be adapted by the U.S. Congress. The move would also eventually result in legal complaints by the World Trade Organization. The Washington Post noted that a Congressional Research Service review of academic literature concluded that the "net overall effect of NAFTA on the U.S. economy appears to have been relatively modest, primarily because trade with Canada and Mexico accounts for a small percentage of U.S. GDP". ^ "NAFTA's Economic Impact". Council on Foreign Relations. Retrieved 2017-07-18. ^ a b "Poll Results | IGM Forum". www.igmchicago.org. 13 March 2012. Retrieved 2016-01-01. ^ a b c Burfisher, Mary E; Robinson, Sherman; Thierfelder, Karen (2001-02-01). "The Impact of NAFTA on the United States". Journal of Economic Perspectives. 15 (1): 125–44. CiteSeerX 10.1.1.516.6543. doi:10.1257/jep.15.1.125. ISSN 0895-3309. ^ a b c "Driving Home the Importance of NAFTA | Econofact". Econofact. Retrieved 2017-02-15. ^ a b "Which American producers would suffer from ending NAFTA?". The Economist. Retrieved 2017-02-19. 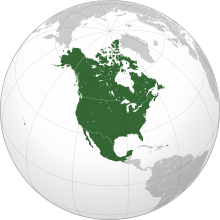 ^ a b "North American Free Trade Agreement (NAFTA)". The Canadian Encyclopedia. Historica Canada. Retrieved 19 November 2017. ^ Rothbard, Murray. "The NAFTA Myth". Mises Institute. Mises Institute. Retrieved 18 March 2016. ^ Trefler, Daniel (Sep 2004). "The Long and Short of the Canada-U.S. Free Trade Agreement" (PDF). American Economic Review. 94 (4): 870–895. doi:10.1257/0002828042002633. ^ Bernstein, William J. (16 May 2009). A Splendid Exchange: How Trade Shaped the World. Grove Press. ^ Romalis, John (2007-07-12). "NAFTA's and CUSFTA's Impact on International Trade". Review of Economics and Statistics. 89 (3): 416–35. doi:10.1162/rest.89.3.416. ISSN 0034-6535. ^ a b c d e Caliendo, Lorenzo; Parro, Fernando (2015-01-01). "Estimates of the Trade and Welfare Effects of NAFTA". The Review of Economic Studies. 82 (1): 1–44. CiteSeerX 10.1.1.189.1365. doi:10.1093/restud/rdu035. ISSN 0034-6527. ^ a b "The coddling of the Canadian cow farmer". The Economist. Retrieved 2018-09-12. ^ H, Hanson, Gordon (2007-03-09). "Globalization, Labor Income, and Poverty in Mexico". ^ O'Neil, Shannon (March 2013). "Mexico Makes It". Foreign Affairs. 92 (2). Retrieved 19 March 2016. ^ Taylor, Guy (14 May 2012). 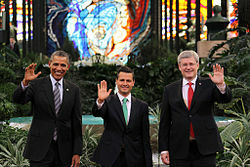 "NAFTA key to economic, social growth in Mexico". www.washingtontimes.com. The Washington Times. Retrieved 19 March 2016. ^ a b "The missing dimension in the NAFTA debate". Washington Post. Retrieved 2017-02-12. ^ https://www.facebook.com/anaclaireswanson. "Trump administration formally launches NAFTA renegotiation". Washington Post. Retrieved 2017-07-18. ^ Frankel, Jeffrey (2017-04-24). "How to Renegotiate NAFTA". Project Syndicate. Retrieved 2017-07-18. ^ a b "NAFTA's Economic Impact". Council on Foreign Relations. Retrieved 2017-02-07. ^ a b Porter, Eduardo (2016-03-29). "Nafta May Have Saved Many Autoworkers' Jobs". The New York Times. ISSN 0362-4331. Retrieved 2017-02-07. ^ Lavassani, Kayvan (June 2018). "Data Science Reveals NAFTA's Problem" (PDF). International Affairs Forum (June 2018). Center for International Relations. Retrieved 7 July 2018. ^ "North American Free Trade Agreement (NAFTA) | United States Trade Representative". ustr.gov. Retrieved 2016-10-12. ^ a b DeLong, J. Bradford. "NAFTA and other trade deals have not gutted American manufacturing – period". Vox. Retrieved 2017-02-07. ^ "What did NAFTA really do?". Dani Rodrik's weblog. Retrieved 2017-02-07. ^ Faux, Jeff (December 9, 2013). "NAFTA's Impact on U.S. Workers". Economic Policy Institute. Retrieved 2016-10-12. ^ Long, Heather (February 16, 2017). "U.S. auto workers hate NAFTA ... but love robots". CNNMoney. Retrieved 2017-02-21. The problem, they argue, is that machines took over. One study by Ball State University says 87% of American manufacturing jobs have been lost to robots. Only 13% have disappeared because of trade ... But workers in Michigan think the experts have it wrong. ^ Bacon, David. "Globalization and NAFTA Caused Migration from Mexico | Political Research Associates". Retrieved 2017-04-03. ^ "THE 1992 CAMPAIGN; Transcript of 2d TV Debate Between Bush, Clinton and Perot". The New York Times. New York Times Company. 16 October 1992. Retrieved 16 May 2016. ^ a b c Millán, Juan. "North American Free Trade Agreement; Invitation for Applications for Inclusion on the Chapter 19 Roster" (PDF). Federal Register. Office of the United States Trade Representative. Retrieved 19 March 2016. ^ Politico Staff. "Full transcript: First 2016 presidential debate". Politico. Retrieved 27 September 2016. ^ a b c d e f Rappeport, Alan (2017-07-17). "U.S. Calls for 'Much Better Deal' in Nafta Overhaul Plan". The New York Times. ISSN 0362-4331. Retrieved 2017-07-18. ^ "U.S. makes lower trade deficit top priority in NAFTA talks". Reuters. July 18, 2017. Retrieved 2017-07-18. ^ a b c "US calls for smaller deficits in new NAFTA talks". BBC News. 2017-07-18. Retrieved 2017-07-18. ^ "Trump announces 'incredible' trade deal with Mexico". BBC News. 27 August 2018. Retrieved September 2, 2018. ^ Journal, Julie Wernau | Photographs by Mark Mahaney for The Wall Street (2017-02-12). "Denim Dilemma". Wall Street Journal. ISSN 0099-9660. Retrieved 2017-02-12. ^ "What is NAFTA, and what would happen to U.S. trade without it?". Washington Post. Retrieved 2017-02-15. ^ Isfeld, Gordon (12 October 2015). "Forget NAFTA, the TPP is the new 'gold standard' of global trade". Financial Post. National Post. Retrieved 31 December 2015. ^ Shaffer, Sri Jegarajah, Craig Dale, Leslie (2017-05-21). "TPP nations agree to pursue trade deal without US". CNBC. Retrieved July 4, 2017. ^ a b Inc., Gallup,. "Americans Split on Whether NAFTA Is Good or Bad for U.S." Gallup.com. Retrieved 2018-04-30. ^ "Redirecting ..." heinonline.org. Retrieved 2018-04-30. ^ "Transcript of the First Debate". The New York Times. 2016-09-27. ISSN 0362-4331. Retrieved 2018-04-30. ^ a b Affairs, Chicago Council on Global. "Pro-Trade Views on the Rise, Partisan Divisions on NAFTA Widen | Chicago Council on Global Affairs". www.thechicagocouncil.org. Retrieved 2018-04-30. ^ Inc., Gallup,. "Opinion Briefing: North American Free Trade Agreement". Gallup.com. Retrieved 2018-04-30. Wikimedia Commons has media related to North American Free Trade Agreement.